Tai Chi is a unique gentle mind-body exercise and art that promotes physical and metal wellness. It is said to be the culmination of traditional Chinese culture and philosophy put into motion. This art emphasizes: relaxation, slowness, correct posture and alignment, balance, circular movement, and calm mindfulness. The Tai Chi practitioner's four primary goals are to attain optimum health, self-defense skills, wisdom, and longevity. There are many. Scientists believe that it is an ideal exercise for the elderly because it can ease arthritic pain, improve: mobility, heart function (arterial compliance), high blood pressure, lower body strength, balance, fight depression, promote deep breathing, improve mental clarity, raise energy levels and improve sleep. For younger people it is an ideal exercise to maintain good mental and physical health especially by reducing stress and putting practitioners in touch with their own bodies. Promoting calm awareness and stabilizing a persons' emotions is just one benefit, letting go of unnecessary tension and moving in a energy-efficient manner is another. In short, with regular quality practice, it improves ones quality of life and positive results can be felt within a few weeks, you don't have to "master" the art before you get something from it. Naturally, the more quality practice you do, the more you get out of it. Why is Tai Chi different? Tai Chi practice doesn't require any equipment or partner and can be practiced anywhere and anytime which makes it inexpensive & sustainable. Why is Tai Chi different? Most notably because Tai Chi emphasizes deep relaxation, alignment and mindfulness in moving the "chi" in flowing whole body coordinated movement instead of tensing and using muscular force. Unlike other exercise or sports that rely on youthful strength, speed or endurance, the practitioner can actually get better with age. Movements in Tai Chi have little to do with the "forceful" actions of muscle contraction. Tai Chi cannot be learned or practiced effectively by "osmosis" or mimicking and is not a dance that can be understood after only a few lessons. For the ordinary person, Tai Chi cannot be "properly"learned from a book or DVD but if you cannot get to a good teacher, this is better than nothing & depending on the information, your quality & consistency of practice, you can still get some of its benefits. If the instructions are good & communicated well, regular practice will at least start you on the beginning of your Tai Chi journey giving you a good foundation till you can find a good teacher. What is needed to learn Tai Chi "properly"
A good teacher who gives clear, systematic, detailed explanation & individual correction. and a process-oriented, reflective mindset. Loose comfortable clothing and flat-soled footwear or practice without shoes. I (Lee Chang Tye) have been studying Tai Chi since 1984. From 1984 to 2000 with: “The Inner School of Martial Arts” with Dr. Cordia Chu, since 2000 with Glenn Blythe at “The Tai Chi School of Gentle Exercise/School of Yi Chi Li” and since 2004 to the present with Wee Kee Jin who is the principal instructor of “The Tai Chi School of Central Equilibrium”. 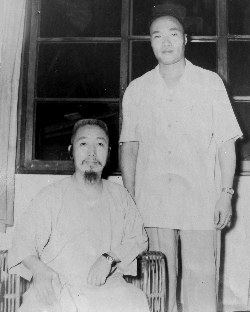 Wee Kee Jin is internationally recognised as one of the authorities of the Master Huang Sheng Shyan Yang Style. 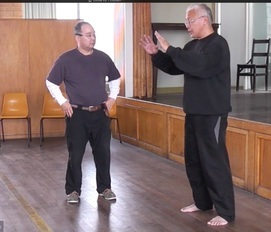 I mostly teach the Huang Sheng Shyan Yang Style system as taught to me by my teacher Wee Kee Jin. 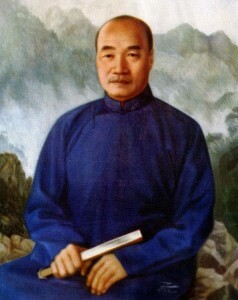 The set in this style is the 37 form Yang style from Huang Sheng Shyan's teacher Cheng Man Ching. My Tai Chi teaching goal is to motivate and educate my students enough so that they can independently persevere and practice this wonderful and beneficial art. Maybe even do their own research and inquiry into the principles and health benefits. I believe that you'll get the most benefits out of Tai Chi by practicing it properly, so detail and being mindful of the Tai Chi principles as it relates to your own practice is important. I also think that once your body gets used to moving in the "Tai Chi" way, practice is enjoyable and you'll always feel better physically and about yourself. It's a healthy addiction and time well spent. 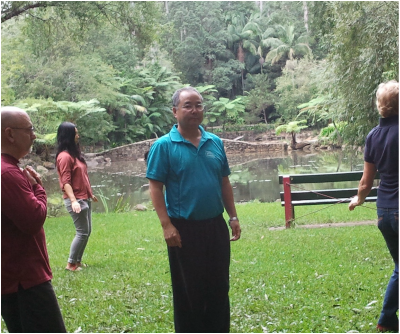 Most people do not know what to expect when they attend my class and this is understandably so, Tai Chi is often mysterious and vague so I give detailed instruction according to the principles and what's been handed down to me. However, I don't expect anyone to "get it" unless they've been practicing diligently for a long time. My emphasis in teaching is more on enjoying the "process" rather than on achievement, and in focusing on the process you will soon find it is "meditation and/or medication in motion". The benefit of this is that you'll get a refreshing rest from your daily problems. The beginner (or someone out of practice) inevitably finds that their thighs, legs & mind will get a good workout, don't worry it's all good for you. The paradox is: you have to do some work to get some real "relaxation" and warm feelings of well being ("Chi"). If you are interested in attending my classes then look at the videos of the short Yang form & the loosening exercises (on this page, below), to get an idea of what I strive to teach class.